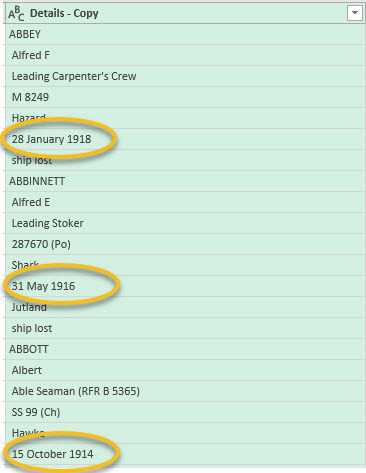 ABBEY, Alfred F, Leading Carpenter’s Crew, M 8249, Hazard, 28 January 1918, ship lost … the record of a man who died on 28th January 1918 when the ship he was serving on was lost because it was involved in the first world war. The question is, how did I do that ? Almost 39,000 rows split as you can see here AND with no formulas in sight. No =LEFT(). No = RIGHT(). 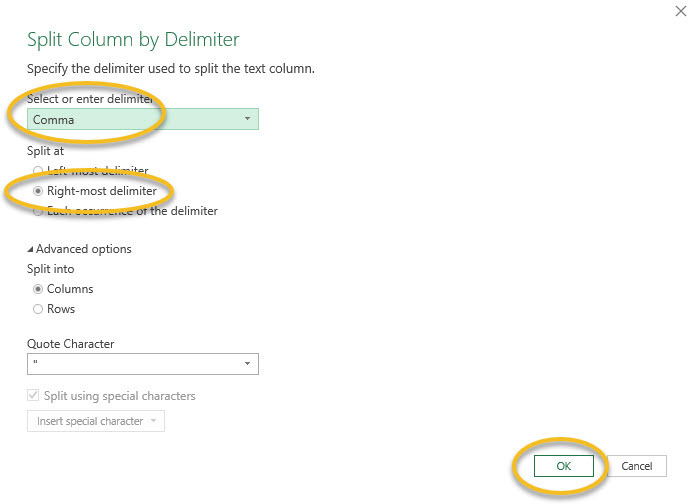 No =MID() … I did it all by using Get & Transform using Excel 2016 … Power Query by its new name. Here is how I did it! The data came as a list so the first thing I did was to turn in into an Excel Table: make sure every column has a heading and that there are no blank rows in the list … in this case there were some blank rows so I selected the entire list and sorted it from A to Z and then deleted all of the blank rows. Now, with the cursor in the list somewhere, click Ctrl+T and Excel starts the process of changing the list into an Excel Table, which will look like Figure 1 above. You really need the latest possible version of Excel for this because we are about to use features that are not included in the 2013 and 2010 versions of Excel. In this case, we split by the right most delimiter and that gives us the Event information we need! 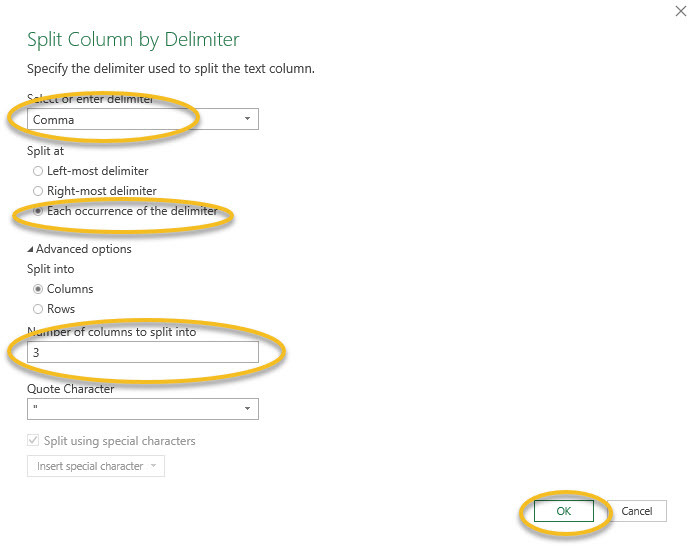 You can delete the Details – Copy column now! We could simply have split all cells at the comma delimiter but in some rows there is a complication: after the Christian name in some rows you will see something like this: (service number not listed … ) and other messages: see the end of this page for advice on what to do with this additional information! All elements of the data are not shown row by row … as at August 2017 this is a fairly new feature! You might say, what? The dates are still buried. True but now we are going to create a Conditional Column to isolate them. See Figure 9 for this step. Look across each row now and you will see that we have six or seven duplicate rows for each person in the database, most of them have the word null in the Dates column but all we want is the date in the Dates column. So finally, select the Dates column and click on the drop down arrow at the top of the column and scroll down to find the word null and deselect it. Click OK. All of the duplicate rows just disappeared! Delete all working columns that you don’t need if you haven’t already deleted them and then that is it: a complete list split out by Surname … Event as you can see in Figure 2 with not one VLOOKUP or INDEX and MATCH combination in sight. 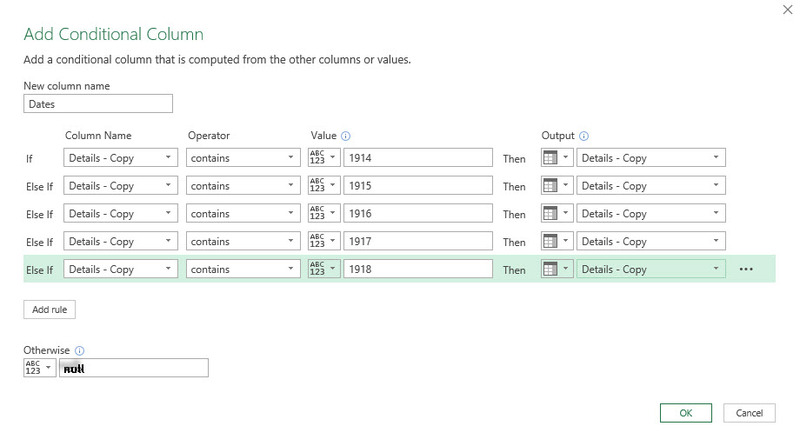 Give your query a good name and then click Close & Load to load your work into Excel. At this stage I have not dealt with the problem of (service number not listed … ) etc as I highlighted above. Since this is a common problem throughout the database, you could Find and Replace the phrases with nothing: delete the whole thing. If you do this and get rid of all such phrases, there will be no need for a conditional column. Moreover, since Get & Transform remembers everything you do, I also recommend that if you do want to get rid of the phrases we are talking about here, do so within Get & Transform so you don’t need to do it all again if this table is ever updated at source. This takes a long time to read I am sure but with practice, this will take you about 10 minutes to do from start to finish! File to download: sorry, this is a large file that does not belong to me but you can download the data from here: good luck with it as it is a very good test of how to split data using Get & Transform.